Vernon Minton often served as mentor and deck hand on youth fishing trips into the Gulf of Mexico off Alabama's coast, where Minton's advocacy for the artificial reef program produced an unparalleled red snapper fishery. The week before the New Year, Alabama lost one of its leaders in the world of conservation. Vernon Minton, Director of the Alabama Department of Conservation and Natural Resources' Marine Resources Division, passed away after a lengthy illness at the age of 61. Minton is remembered as as a gentle giant who maintained a calm head while others about him were losing theirs. His knack for the art of compromise served him greatly during the battles between the commercial and recreational anglers. His promotion of the artificial reef program, both inshore and offshore, has resulted in excellent saltwater angling opportunities and an unparalleled red snapper fishery. Conservation Commissioner Barnett Lawley witnessed first-hand Minton's efforts for the past eight years. "Vern did an admirable job in managing the fishery as our director and as a member of the Gulf of Mexico Fishery Management Council," Lawley said. "I think Vern was always very fair. As long as both sides were complaining, you knew he was making the right decision. I never saw a situation where you could say he was leaning this way or that way. "Vern loved his job, loved his people. He was as dedicated as anybody to the State of Alabama in what he did. A lot of people are in this for their ego, but Vern was not one of those. He was a very knowledgeable, articulate man - someone that you were proud to have stand up and represent your state and your department." Longtime colleague and fellow marine scientist Bob Shipp shared many Gulf Council meetings, as well as many trips into the Gulf on red snapper research outings. Shipp agreed that Minton's imposing 6-foot, 6-inch frame belied his demeanor. "The thing that stood out most for me with Vernon was his concern for the people involved in the fisheries," said Shipp, head of the Marine Sciences Department at the University of South Alabama and chairman of the Gulf Council. "Even in areas where we disagreed, like the gill nets, a lot of what he did was because he felt so strongly for the people. He really had a huge heart. I'll never forget one day I was on I-10 heading east and a car was broken down on the side of the road. About 50 feet beyond them, Vernon had pulled over. They were total strangers, but he was walking back to help them. That's just the kind of person he was." As members of the Gulf Council, Shipp said years of reductions in snapper seasons and bag limits were especially disconcerting to Minton, who knew from first-hand experience that the status of the red snapper stocks did not match the dire predictions of what he considered were flawed computer models. "As far as conservation was concerned, Vernon was totally committed to the artificial reef program and the snapper stocks," Shipp said. "It was really frustrating for him to see the failing of the science - how far behind the science was - and having to operate in that system. He had great respect for science, but the databases were so inadequate, which translated into shortened seasons and people being cut out of work. He had a difficult time accepting that. "The work Vernon did on rearing red snapper was especially noteworthy. He worked with Auburn faculty and students and they made the breakthrough on the larval food for red snapper. Once they made that breakthrough, the mariculture of red snapper was certainly possible." At the Claude Peteet Mariculture Center in Gulf Shores, Minton was involved with many fisheries projects that included red drum, shrimp and spotted seatrout. He also found a way to get funding to build a saltwater intake and pipeline that pumped water from the Gulf to the Peteet Center for the effort to successfully spawn red snapper. Chris Blankenship, Acting Director of Marine Resources, said Minton's ability to bring people together for a common cause served as a valuable lesson. "Vernon had a big impact on Marine Resources over the last 20-plus years," Blankenship said. "He forged a lot of relationships with federal partners and with non-governmental organizations that have an interest in the fisheries. "I think what people will remember is that he listened to all sides of a situation. He looked at the science and tried to do what was the overall best for the fishery. I learned a lot from Vern - a lot about fisheries management and a lot about dealing with the public." Steve Heath, who retired in 2009 as Chief Marine Biologist, worked with Minton for 31 years at Marine Resources and witnessed a significant shift in the way fisheries management was conducted. "The flavor of marine resources and management changed over those 30 years," Heath said. "When we first started, the division and department mandated what was going to happen in terms of regulations - size limits, bag limits and seasons. There wasn't a lot of involvement from the public. But over the 30 years, the fishermen, both commercial and recreational, became more involved in the process. People became much more aware of how regulations and laws were created and were able to have input and express their opinions. "By the time Vern became director and I became Chief Biologist, we were very much involved in what I call co-management. We would sit down with the fishermen and discuss what we needed to do, based on our data. We would get their input from their experience. Then we would use the combination to reach the desired result." Heath said when Minton became director in 1990 he quickly became immersed in the controversy between recreational anglers and gill net fishermen. "We were involved during a tremendous period of growth for marine resources in Alabama," Heath said. "When he first became director it was a baptism of incredible fire. He walked right into the situation when recreation fishermen wanted to eliminate gill net fishing. He spent many long hours and days to come up with a compromise that would allow each side to share in the harvest. And he succeeded. "He worked hard to ensure that the commercial sector got to share in the fishery. At the same time, he got redfish and speckled trout declared game fish during his tenure. He also did a tremendous amount to increase our artificial reef program, and he started the inshore reef program. He was instrumental in the establishment of the saltwater fishing license, which provided much needed funding for fisheries management. I think Vernon's legacy was his ability to work with all the different user groups." Shipp thinks the outstanding red snapper fishery off the Alabama Coast will represent Minton's contribution to marine conservation. "I think the artificial reef fishery for snapper and grouper will continue to be recognized as one of the outstanding fisheries in the United States," Shipp said. 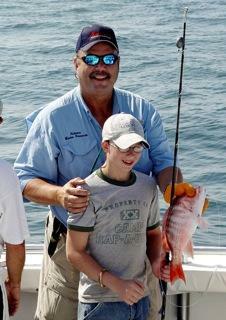 "The tiny coast of Alabama produces a third of the Gulf of Mexico's red snapper. That resulted from Vernon's effort to continue to put out artificial structures and do it in a way that was environmentally sound. I think that fishery will be his greatest legacy."